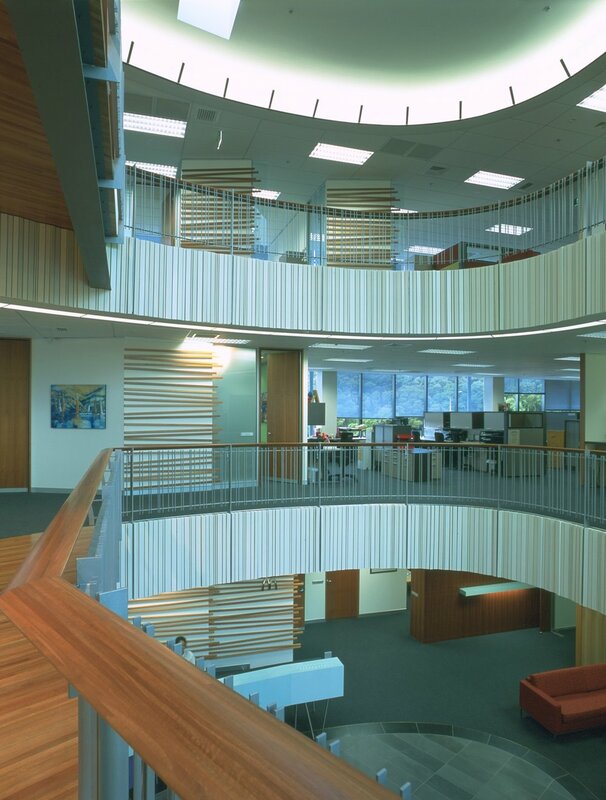 A new corporate head office for McDonald’s, this building accommodated around 120 people who control the restaurant and franchise operation in New Zealand upon its completion in 2001.
operation in the old Saint Patrick’s school building on Wellington Street. A key component of the brief for the new building was to integrate the old and new buildings. This is the origin of the courtyard linking the two, and controlling access to the training centre from the new reception area. There are two layers of car parking concealed below the courtyard level, with parking for 125 cars. The three floors (1000 sqm each) of office accommodation extend from the entry atrium along the motorway on-ramp to the south-east corner. In general, the enclosed rooms are along the centre of the floor, leaving the two window facades free for workstations. A staff café on the ground floor opens to the courtyard, and there are generous time-out areas throughout the building. Colour and texture, both inside and out, is intended to portray warmth and friendliness, as opposed to stark minimalism. The use of colour internally is strong, using white with natural timbers. The building was sold around 2007 to a consortium including Aspec Properties, and is now occupied by Draft FCB. ASC Architects are currently working on a concept for the remainder of the site.